High amounts of glycogen replacing glucose polymers along with high tech electrolytes, creatine, glutamine and much more, make Power Boost the ultimate rehydrator and recuperation product. Power Boost keeps your dog going before, during and after work. Schutzhund, Hunting, Agility, Fly ball, and Rally dogs will all greatly benefit from this product. Power Boost keeps them running cooler. We have many police K-9 officers that give Power Boost to their partners, especially in the warm summer months. These dogs can be called upon to do extreme work at any time. Feedback from the officers is that Power Boost really helps them while working or training and their recovery time is very quick. 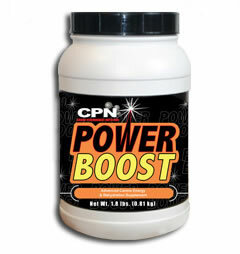 Power Boost was first developed as a lower fat, lower protein alternative to Vertex. Dogs competing in sports like sled racing, weight pulling and any sport that involves hard fast anaerobic exercise will benefit greatly from Power Boost as it is high carbohydrate, low protein, and low fat for rapid glycogen and electrolyte replacement and carboloading. Power Boost is also great when you want those carbs but you don't want the heavy calories that come with a high fat content. For instance, rehydration between performances and even during hot summer days! Many canine endurance trainers use Vertex for those long hard workouts and then switch over to the Power Boost for the last ten days to two weeks before the competition. Power Boost has all the great nutrients of Vertex - creatine, glutamine, lactic acid buffers, Vitamins C, E and ginseng - but less than half the protein and fat . When combined, the two products produce an amazing result!